Dharma Internet: Pros and Cons David Snyder, Ph.D. 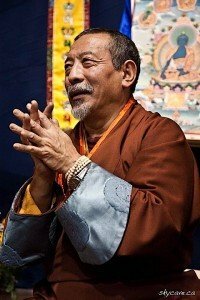 Recently, during an interview with Venerable Zasep Tulku Rinpoche, he spoke at length about the internet: the positive aspects, and the downsides. It was an interesting take on digital dharma. 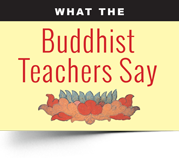 I decided to research what other teachers have to say about the promise and dangers of Buddhist Dharma teachings online beyond the obvious pros vs cons: accessibility of Dharma teachings vs. misinformation or false Dharma teachings. In this feature, you’ll find the opinions of seven teachers and two other experts. On one point most of the teachers are virtually unanimous: Internet Dharma should play a supportive, informative role — not the replacement for an experienced teacher. Venerable Zasep Tulku Rinpoche, spiritual head of Gaden for the West and Gaden Choling Toronto, at a Medicine Buddha teaching. Photo by SkyCave, Shivankur Sharma. During an extensive interview with Buddha Weekly on wide-ranging topics, Venerable Zasep Rinpoche commented on the Dharma via internet: “Generally, it has a positive effect. It’s beneficial to have easy access to teachings on YouTube, and you can download material, pictures and sadhanas and you can find so much information. It’s generally useful and helpful. “It all depends on the individual. Internet can be very impersonal, you know? It can also be addictive. Even some monks, now, instead of holding malas and doing mantras, they have their phones in hand, sending messages, text messages. In some ways it’s nice. The monks even use chat for spiritual debating. But in some ways it’s really bad. Instead of doing mantras and practices, they spend time online. Zasep Rinpoche, during an interview, said: “Even some monks, now, instead of holding malas and doing mantras, they have their phones in hand, sending messages, text messages.” Above: monk with Ipad. “Buddhism” top ten Google search. 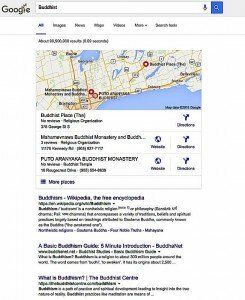 According to an article in Tricyle Magazine, only Buddhanet really deserved a top ten spot as an informative site on Buddhism. Online, there are numerous “interpreted quotes” and “false” quotes from this popular sutta. 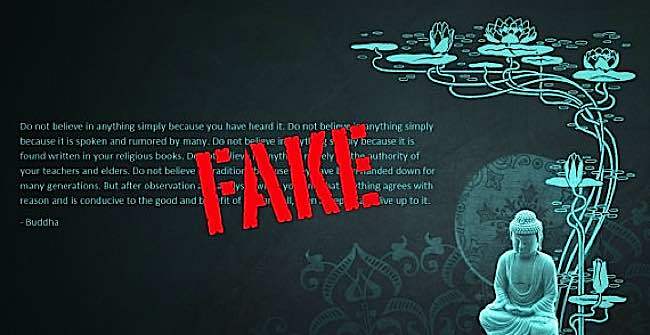 A lively debate on “fake quotes” from Kalama Sutta on the “Fake Buddha Quotes” website more or less debunks the most common online versions of this teaching. This may seem harmless to many, but can be misleading for a student seeking the actual Dharma, especially where it deals with the profound wisdoms spoken by the Buddha. A quick search on “Digital Dharma” or “Buddhist Dharma” brings literally millions of hits on Google. Specialty sites, such as Radio Buddha: Free Dharma for a Free Planet,  make it easy to access the teachings of the greatest teachers. A search of any sutra will likely result in a downloadable document. Even highest yoga tantras and restricted teachings seem freely available online. YouTube videos featuring Buddhist teachers are continuously streamed. Making Friends with Death, by Judy Lief. 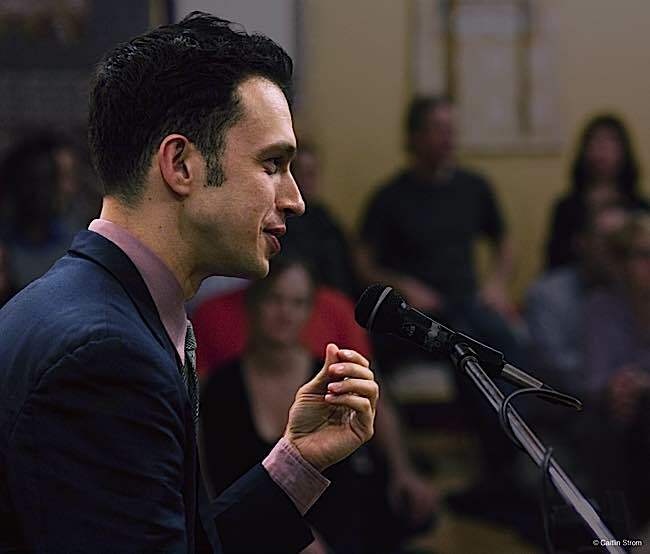 He explained that the reason DIY Dharma becomes cheap and commoditized is that students tend to “make the surface all there is” without ever developing depth in the teachings. Sangha: Disassociation with a living Sangha. Buddhist monks in Thailand using a computer on the floor of the temple. Computers, mobile phones and tablets are common today in temples and monasteries. 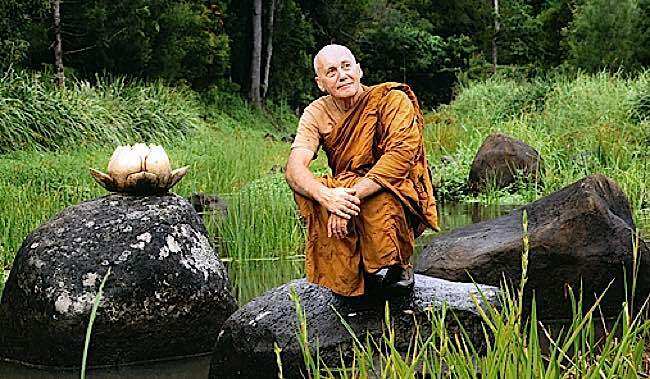 Venerable Pannyavara is the webmaster at BuddhaNet, a reliable source of Dharma information. 2.5 hour Buddha Weekly interview, during Zasep Tulku Rinpoche’s Toronto Tour in fall of 2015. 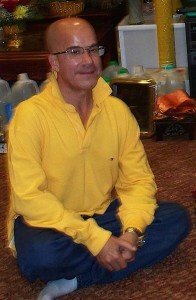 David Snyder, Ph.D. profile on Dhamma Wiki. Buddhism, the Internet, and Digital Media: The Pixel in the Lotus, Editors Gregory Price Greive and Daniel Veidlinger , Routledge, 2014 ISBN 1317950348, 9781317950349: quoted from the chapter “Buddhist Apps” by contributors Rachel Wagner and Christopher Accardo. “Google’s Buddhist Top Ten“, Jeff Wilson, tricycle Magazine. if you have no choice but to do DYI dharma, is there anywhere you can receive help from a teacher via the internet? Hi Lisa, For years I depended on Internet teachings, since I live remotely. The best advice I can give is that of the Dalai Lama: “The ultimate authority must always rest with the individual’s own reason and critical analysis.” Also, I would add that I personally would not rely on teachings until I investigated the source. Dharma is easily accessible online, but much of it is misquoted (just search Buddha’s misquotes in Google — countless famous sayings attributed to Buddha are fabricated). Much of it is nonsense. Some of it is political or extreme. But with the negative comes the positive — genuine Dharma teachings are more accessible than they ever have been. In one way we are fortunate, in modern society we do have access to real teachers who travel and make themselves accessible. We also have the internet. For both — teachers and internet searches — the same cautions apply. Research the teacher and lineage. If the teaching is a written teaching online, only take it seriously if there are many credible citations and sources. Made-up Dharma is more common than the genuine Jewel of Dharma. At the same time, because of extremism online, trolling and politics, the internet can be misleading. I would never rely on anything read online unless it has citations and links from a credible source, sutra or teacher. Often, for instance, in Buddhist forums, you see contrary opinions on everything, so extreme they almost make things worse for someone seeking simple information. Without citations — and your own good judgment — these have to be taken with a grain of salt. I’ve seen great Buddhist teachers with long lineage and great teachers, flamed, attacked or insulted. If we took all this seriously, just because someone vented online, we might never find our way to an authentic teacher. This is why lineage is so valued in Buddhism. If you’re receiving teachings from a teacher with a long lineage, the teachings are less likely to be incorrectly interpreted. Even when you find a good source online, or a good teacher, Buddhism, as you know, ultimately requires personal journey and discrimination. And, if the teaching seems to foster negative emotions, or rigidity, it’s probably not genuine. Again, from the Dalai Lama: ““The whole purpose of religion is to facilitate love and compassion, patience, tolerance, humility, and forgiveness.” In other words, if you’re comfortable, and it passes the test of credibility and compassionate insights, that’s usually enough. Any internet source that fosters intolerance, lack of compassion, lack of humility, lack of forgiveness would be off my personal list. For more general information, or a cross-section of opinions and insights, periodicals such as Buddha Weekly, or Tricycle would be valuable. In these type of sites/publications, they interview genuine teachers and/or cite sources. I know how you feel about the internet — I live very far from urban centres — so I know how convenient it is. Having said that, teachers often travel annually or semi annually to different locations. 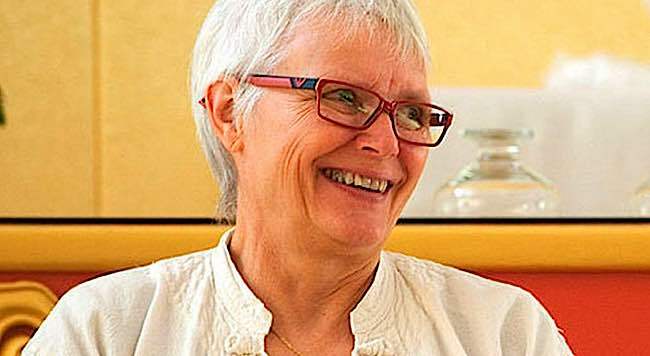 My own teacher travels to various locations in Canada, US, Australia, Mexico and Mongolia, and I was fortunate enough to notice a teaching (a three hour drive from where I am) years ago. The internet can be good for searching events and local teachings. Regardless of where you live, there likely is a Buddhist centre or at least events from visiting teachers. Nothing can replace that experience. Very helpful collection of voices and opinions on a very important topic! I particularly resonated with the last opinion — Venerable Pannyavara: “Authentic or not?” Thanks so much for this!